Many say Thai words are difficult to pronounce. One mispronounced phoneme will result to a totally different word, which could potentially make someone infamous in no time. Let’s make a Fox 7 reporter, a Texan news channel as an example. 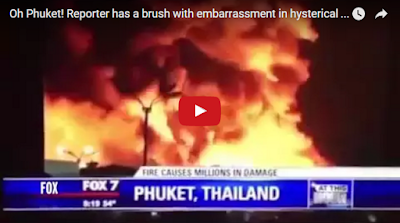 This unidentified reporter made an embarrassing mistake after mispronouncing Phuket as “Fuk-et” during a fire at a SuperCheap store in Thailand’s famous island in 2013. The reporter pauses for a second or two before fumblingly saying the name of the island wrong. It was a mistake made for a second but will be remembered forever after the footage was uploaded on Youtube on Sunday. Clearly, she had not enunciated this foreign word before. She corrected herself the second time, though.